In the XIX century, Nicolas L. Sadi Carnot made statement concerning the efficiency of engines. He declared that the term "perfectly efficient heat engine" could not be applied to any heat engine. He believed that an engine in which all heat would be converted to mechanical work did not exist. 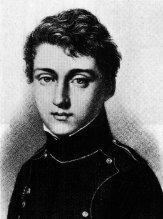 Carnot also believed that the efficiency of a heat engine depended on the difference between the highest and lowest temperature reached in one cycle. That is, in mathematical terms, E = (T1 - T2 ) / T1.The difference of the temperatures is directly proportional to the efficiency of the heat engine. This conception was proved with his thermodynamic cycle (thermodynamic processes that after numerous stages return a system to its initial state) known as the Carnot cycle, which is the basis cycle of all heat engines. This idea is also presented in the second law of thermodynamics stating that there is a limit, less than a hundred percent, in the efficiency of engines. Stage 1: In the first stage, the piston moves downward while the engine absorbs heat from a source and gas begins to expand. The portion of the graphic from point A to point B represents this behavior. Because the temperature of the gas does not change, this kind of expansion is called isothermic. Stage 3: The piston begins to move upward and the cool gas is recompressed in the third stage. The heat goes to sink. Point C point D represents the decrease in volume and increase in pressure. The engine gives energy to the environment. This stage is called isothermal compression. Stage 4: In the final stage, the piston to move upward and the cool gas is secluded and compressed. Its temperature rises to its original state. Point C to point D illustrate this behavior; a continuing increase in pressure and decrease in volume to their initial position. Energy stays, so it's an adiabatic compression. The Carnot Cycle forms the perfect process of a heat engine. Many engineers tried to reach this kind of cycle. Rudolf Diesel had the most success and his engine is nearly as perfect as the Carnot engine (See Technology part). There are also other cycles, e.g. the Stirling Cycle you see on the right side.